Sources said the state government had arrested Kisan Mahasabha president Amara Ram, Pemaram and over 80 farmer leaders two days back to avert the protest. 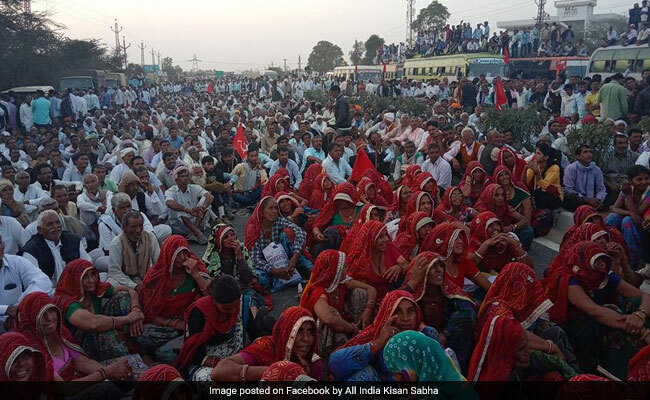 Jaipur: Rajasthan farmers staged a massive protest on Jaipur-Sikar highway on Thursday to press for fulfilment of their demands, including complete loan waiver and implementation of the recommendations of Swaminathan Commission. The farmers first tried to gherao the state assembly, but as they were not allowed to enter Jaipur, they staged a demonstration on the road, leading to serpentine tailbacks. Around 5,000 vehicles remained stuck in the jam for several hours, causing immense inconvenience to the people from adjoining districts like Jaipur, Sikar, Churu, Bikaner and Jhunjhunu. Chief Minister Vasundhara Raje announced in her budget speech that debts up to Rs 50,000 would be waived off, but the farmers are demanding full waiver. Meanwhile, despite massive police deployment at the city's borders, some farmers managed to sneak into the city, in response to the call given by Akhil Bharatiya Kisan Sabha. Later, they held a meeting at the Majdoor Kisan Bhawan in the city, which was addressed by Kisan Sabha president Ashok Dhaval and vice president Dulichand Meena, among others. Thereafter, the protesting farmers, which also included women, proceeded towards the state Secretariat. But they were detained by police. Independent MLA Kirodilal Meena and Hanuman Beliwal, who announced forming a third front a few months back, were also part of this protest. Speaking to the media, Home Minister Gulabchand Kataria said the farmers were stopped on the outskirts in line with the orders issued by the high court, and that no serious cases had been registered against any of them.